This calculator estimates the water application for a single sprinkler by setting up a simple home experiment. 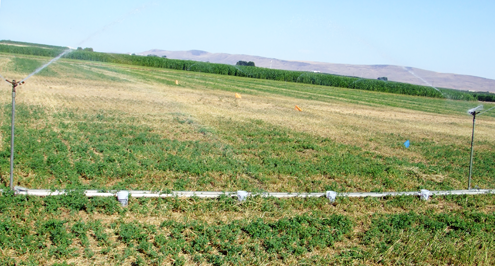 In order to replicate the experiment, you will need two sprinklers of the same type, and 4 cans. Arrange the four cans between two sprinklers as shown in the figure below. Operate the sprinkler for 15 minutes or more and measure the depth of water collected in each can. Enter the measured depths in the following boxes. This calculators use these formulas to determine the Sprinkler Flow Rate.